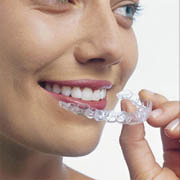 Our dentists are offering free consultations for Invisalign to answer questions about the treatment. Wondering if Invisalign is right for you? Call to make an appointment for a free consultation and find out. Invisalign treatment is usually eligible for reimbursement under FSA plans, and no-interest payment plans are available for qualified patients. Invisalign Express 5 is best for patients who have minor orthodontic issues, such as mild crowding or spacing issues, or orthodontic relapse. This five-stage Invisalign treatment offers the same high-quality features as Invisalign. Invisalign Express 10 works just the same as Invisalign, but with shorter treatment duration. It can be used to as a treatment for minor cases of crowding or spacing, as well as orthodontic relapse. Invisalign Teen is designed to address the orthodontic needs of non-adult patients. It offers all the features of Invisalign as well as compliance indicators and six replacement aligners. Invisalign Full is the clear alternative to traditional braces. It uses a series of virtually invisible aligners that are custom-made for each patient to address their unique orthodontic needs.